Wado-ryu or Wadoryu is one of the world's major karate styles (the six biggest styles being Shotokan, Wadoryu, Shito Ryu, Goju Ryu, Kyokushin, and Kenpo). On the surface it looks very similar to other styles such as Shotokan. However, there are some important differences. It may be argued that Wado-ryu is a Jujutsu style rather than Okinawan Karate. When first registered with theJapanese Dai-Nippon-Butoku-Kai in 1938 the style was called Shinshu Wadoryu Karate-Jujutsu, a name which reflects the hybrid nature of Wado. Wado-ryu's founder Hironori Ohtsuka was already a licensed practitioner in Shindo Yoshin Ryu and Yoshin Koryu Jujutsu when he first met the Okinawan karate master Funakoshi. 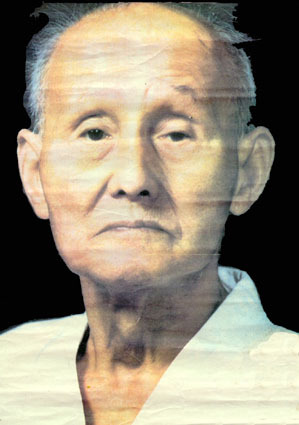 After having received tutelage of not only Funakoshi but later also the Okinawan masters Mabuni and Motobu, he set off to merge Shindo Yoshin Ryu with Okinawan Karate. The result of Ohtsuka's efforts is Wado-ryu. While its techniques may be very much karate in looks, most of the underlying principles have been derived from Shindo Yoshin Ryu. A block in Wado may look much like a block in Shotokan, they are nevertheless performed from a completely different perspective. A Shotokan practitioner is likely to force an incoming fist out of the line of attack. A Wado expert, on the other hand, will rather move himself out of the line of attack while taking up a position that will gain him an advantage over the opponent. Both ways will look almost similar to the untrained eye, but couldn't be further apart when considering the tactics behind them. Key in Wado-ryu is the principle of taisabaki, often wrongly referred to as evasion. The Japanese term can be translated as body-management and refers to body manipulation so as to move the defender as well as the attacker out of harm's way. The way to achieve this is to move along rather than to move against. Or, harmony rather than strength. Perhaps the nature of Wado is better understood when considering its Jujutsu origins. In 17th century Japan, a young physician departed on a journey to China. His name was Yoshitoki Akiyama. During his stay in China he learned Chinese healing methods as well as Chinese fighting techniques. After a while Akiyama returned to Japan and retreated in a monastery where he devoted himself to meditation. During those days he also practiced and perfected his technique. One snowy day during winter, Akiyama sat gazing at a willow tree. It suddenly occurred to him that the willow tree, unlike some other trees, didn't have any broken branches, despite the heavy snow. The willow branches simply yielded and allow the snow to fall off. Sturdier trees with unyielding branches suffered much heavier from the elements of nature. After this revelation he developed 303 techniques which became known as Yoshin Ryu Jujutsu or Willow Heart Style. Yoshin Ryu later evolved into Wado-Ryu but the fundamental yielding principles have still been preserved. The term Wado-ryu can be broken into three parts: Wa, do and ryu. Wa can be read to mean harmony. Do is a Japanese term for way. ryu simply means style. Wa or harmony shouldn't be interpreted as pacifism in any way. It is merely the acknowledgment that yielding is sometimes more effective than brute strength. However, modern karate competition tends to transform Wado-Ryu away from its roots towards a new generic karate that appeals more to the demands of both spectators and competitors. From April 1st, 1981, after the split-up of Wadokai, Hironori Ohtsuka sensei changed the name of his organization into Wado-Ryu Karatedo Renmei, with Renmei meaning 'group' or 'federation'. After his death in 1982, his son Jiro Ohtsuka continued the style under his leadership. He became the second grandmaster of Wado Karate and honored his father by taking the name Hironori Ohtsuka II. A third major Wado organization, Wado Kokusai (Wado International Karate Federation), was founded in 1989 by Tatsuo Suzuki Sensei.